WestJet beat previous estimates of unit cost reductions in 3Q2013, but overall the quarter was paradoxical for the carrier as yields and unit revenues continued to be pressured by high capacity growth; however, at the same time the airline is pleased with one of the main drivers of the capacity increase, the launch of its regional carrier Encore. After unit revenues fell nearly 5% in 2Q2013 and almost 4% in 3Q2013, WestJet foresees flat unit revenue growth during 4Q2013 and is declining to offer guidance for FY2014 even as unit costs could grow by 1% during that same time period. The carrier has undertaken numerous significant projects during 2013 in addition to the launch of a new airline – most notably the introduction of a premium economy section on its Boeing 737 narrowbodies and fare bundling options. At the same time WestJet now believes it will deliver on a CAD100 million (USD96 million) cost-cutting scheme a year early, by the end of 2014. Presumably all of those initiatives will pay off in the long term, but in the short term WestJet may continue to face pressure in some key financial metrics. 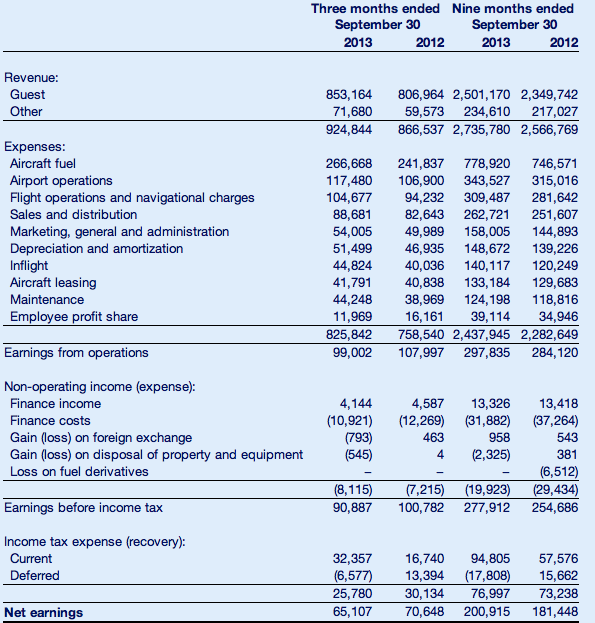 Overall, WestJet’s top-line profits during 3Q2013 fell nearly 8% from CAD71 million (USD68 million) to CAD65 million (USD62 million) year-on-year. Revenues grew 7.8% to CAD925 million (USD884 million) while expenses increased roughly 8.8% to CAD825 million (USD789 million). Its operating income fell about 8% to CAD99 million (USD95 million). In discussing the results with analysts, WestJet essentially outlined the same pressures as highlighted during 2Q2013, its own hefty 11% capacity increase in 3Q2013, competitive capacity growth (especially from Air Canada in western Canada), and pricing pressure on the upper end of the yield curve. Echoing previous sentiments expressed during 2Q2013, WestJet CEO Gregg Saretsky stated that WestJet was unapologetic for the capacity increase during 3Q2013, emphasising WestJet increased its supply to improve the carrier’s market position, particularly among corporate travellers. He also boasted that WestJet is logging a large number of new corporate accounts, particularly among the oil and gas sectors. He stressed those firms are not new companies; therefore WestJet is benefitting from share shift. WestJet’s double digit capacity increase during 3Q2013, that was dilutive to unit revenues during the quarter, was mainly driven by increases in supply on transcontinental routes and the continuing roll-out of Encore. The third quarter was the new airline’s first full quarter of operations, and at the end of 3Q2013 Encore was operating five aircraft in 42 daily departures to 12 destinations. Reiterating previous comments regarding the positive launch of Encore, WestJet management stated that examining the new carrier’s performance on a stand-alone profit and loss basis, it was tracking ahead of plan. Loads are higher than the carrier expected; however, they believe that Encore’s load factor will start to trend more towards a regional carrier operation (lower than mainline) as the airline launches more heavily travelled city pairs and thinner markets as well. Mr Saretsky remarked that roughly 50% to 60% of Encore’s passengers connect onward to WestJet mainline flights, which has been the case since the carrier’s Jun-2013 launch. As for future plans, WestJet’s CEO stated the carrier plans to establish an Encore crew and maintenance base in Toronto during the summer of 2014, and also needs to make a decision regarding exercising some of the 25 options it has with Bombardier for additional Q400 turboprops. Encore is accelerating one aircraft delivery from 1Q2014 to 4Q2013 to end the year with eight aircraft and will accept delivery of eight more Q400s during 2014. Roughly half of WestJet’s system-wide 4% to 6% estimated capacity growth for 2014 is stemming from Encore’s expansion, whose shorter-hauls are helping to drive the company’s stage-length down 5% for the year. WestJet estimates Encore will represent roughly 16% of system-wide departures in 2014, and company executives explained the shrinking stage lengths are partially driving unit cost guidance for 2014 of flat growth to a 1% rise. On a stage-length adjusted basis, WestJet estimates that its unit costs during 2014 would decrease 1.8% to 2%. WestJet’s 2% unit cost decline in 3Q2013 was better than previous guidance of a 0.5% to 1.5% decrease. The better-than-expected cost performance was attributable to dilutive effects of additional capacity, reduced aircraft leasing expense and lower airport operating expense. During 3Q2013 WestJet determined that it would beat its previously stated goal to reduce annual costs by CAD100 million (USD96 million) a year early at the end of 2014. Among the cost savings are CAD30 million (USD29 million) from an exemption granted to WestJet by Transport Canada that allows a new flight attendant staffing ratio of one crew member per 50 passengers, and an expected continuation of fuel burn improvements that netted CAD6 million (USD5.7 million) to CAD7 million (USD6.7 million) during 3Q2013. Mr Saretsky explained that the total annual cost reductions are essentially split evenly among three previously identified categories – aircraft utilisation and distribution, overhead efficiency and productivity. WestJet for the moment is declining to offer unit revenue guidance for 2014, but believes that it will hit the top of its targeted range of CAD50 million (USD49 million) to CAD80 million (USD77 million) in revenue from its fare bundles, one of which features the premium economy option. The carrier sells the bundles at the time of booking or for an upgrade 24h before travel. The latter option is recorded under ancillary revenues, and WestJet during 3Q2013 recorded CAD5 million (USD4.8 million) under that revenue category from the “Plus” upgrades, which is the top-tier fare bundle that features premium economy. Overall, WestJet’s top-line ancillary revenues grew 28% year-on-year during 3Q2013 to CAD44 million (USD42 million) from CAD34 million (USD33 million). Basically, half of the CAD10 million (USD9.6 million) rise in top-line ancillary revenues was attributable to Plus upgrades, which came into full force in Aug-2013. WestJet has turned profits for the last 34 quarters, and to sustain its profits while launching a new airline and introducing a significant new product scheme is commendable. But there is some uncertainty heading into 2014 as the only guidance the carrier is giving so far is a cost uptick. Its 4% to 6% capacity growth for 2014 remains unchanged, but it is below the 7% to 7.5% anticipated increase in 2013 as WestJet’s Boeing 737 narrowbody fleet will remain essentially flat year-on-year from YE2013 to YE2014. Overall the carrier sees an improved and steady environment heading into 4Q2013 and 2014. But the competitive pressure it has been seeing from rivals Air Canada and Porter will only continue as WestJet makes a play to take even more corporate share. WestJet’s profits can likely withstand the competitive pressure, but investors may grow weary of the carrier’s profitability being dragged down by pricing pressure, as evidenced in 3Q2013. With the launch of Encore behind it, 2014 may prove to be crucial for WestJet to prove the business case for launching a regional subsidiary.